Hi! This is the only package of its kind on Tradebit. Ive combined a resale rights ebook and a graphics template to give you more choices and increase your sales. It is a very affordable package and everything comes neatly in 1 zip file. Youre probably thinking, Why in the world would I want to create a worm farm? Well, worm farming for a lot of people is considered a hobby. However, when they find out the benefits that come with doing it, they get pumped up and really get serious about it. More people are embracing green living and are seeing the results. So, why dont you join them? Worm farming can show you a new way of enriching soil. And if you are a plant lover, you can use the soil with your plants so they will be healthy. In addition to that, you can use the compost in your garden. Do you want to know why this is a good concept? Because when you mix the compost with the soil, you end up with a toxin free, organic mixture. * How composting affects fruits and vegetables. * Why compost piles should not have a lot of moisture. * What aeration does in relation to the worm farm and the compost pile. Composting is part of the green living concept. It is part of the recycling method when the worms are consuming the organic waste. The compost can also be used as fertilizer for plants and gardens. 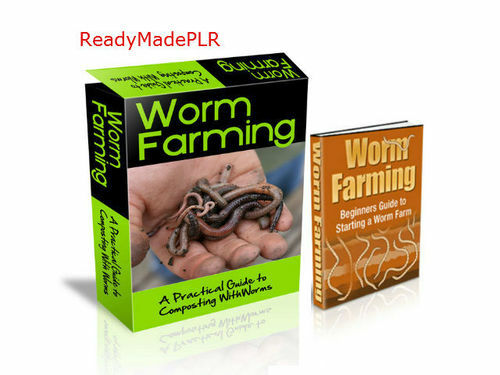 If you are into green, environmentally friendly, living, you might want to take up the hobby of worm farming! Home Automation/ Security/ Energy - 3 Ebooks with PLR!